Exclusively for our European customers our top end, SCART to SCART, triple shielded cable with Gold connectors. Can be used for all types of a/v devices which support Scart connection. 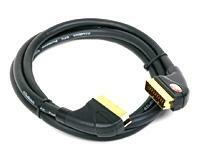 Exclusively for our European customers, SCART to 3 RCA A/V cable. Cable is bi-directional, equipped with in/out switch.